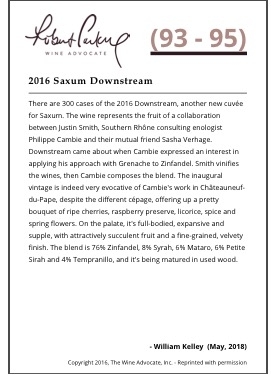 There are 300 cases of the 2016 Downstream, another new cuvée for Saxum. 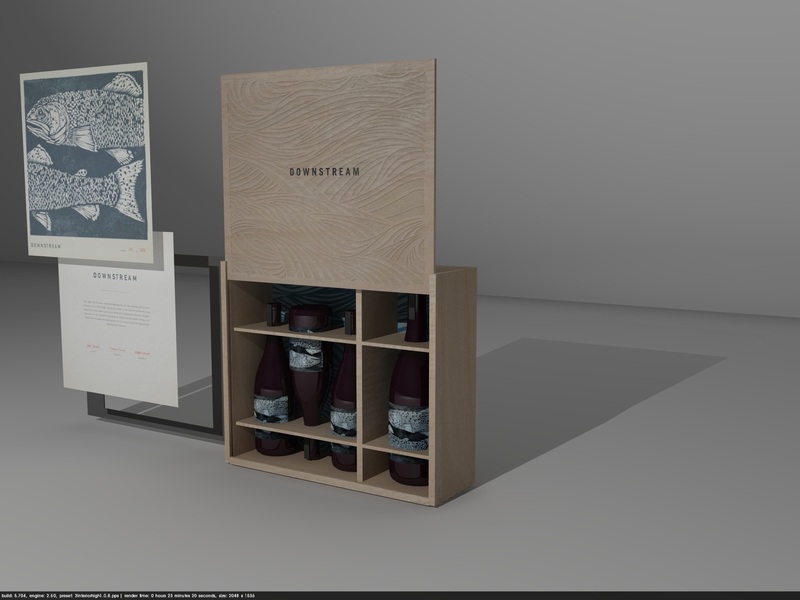 The wine represents the fruit of a collaboration between Justin Smith, Southern Rhône consulting enologist Philippe Cambie and their mutual friend Sasha Verhage. Downstream came about when Cambie expressed an interest in applying his approach with Grenache to Zinfandel. 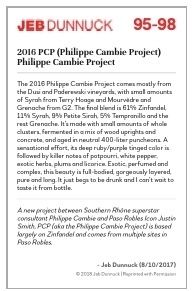 Smith vinifies the wines, then Cambie composes the blend. The inaugural vintage is indeed very evocative of Cambie’s work in Châteauneuf-du-Pape, despite the different cépage, offering up a pretty bouquet of ripe cherries, raspberry preserve, licorice, spice and spring flowers. On the palate, it’s full-bodied, expansive and supple, with attractively succulent fruit and a fine-grained, velvety finish. The blend is 76% Zinfandel, 8% Syrah, 6% Mataro, 6% Petite Sirah and 4% Tempranillo, and it’s being matured in used wood. Success sometimes breeds complacency, but that’s emphatically not the case for Justin Smith, whose status as Paso Roble’s most celebrated winemaker has done nothing to dim his urge to experiment, evolve and improve. Without sacrificing any of their power and authority, both of which come easily in this warm climate, Smith’s Saxum wines continue to gain in structural refinement, energy, integration and incipient complexity with every passing vintage. Since the end of the last decade, Smith has been experimenting with whole cluster, a technique he tends to employ in cooler sites and vintages, since extracting excessive stem tannins is a danger in riper, warmer years. Fermentations are cooler and slower, which helps to manage extraction. While new oak was once an important influence in the Saxum wines, its presence is more and more subtle: Smith now works with puncheons instead of smaller barrels, and they’re complemented by amphorae and foudres. Since 2010, he has employed Roussanne for co-fermentations with Syrah in the place of Viognier, since it brings less additional power and alcohol. He also continues to refine and adapt his blends from year to year. Smith’s new cellar now means he has the space necessary to mature wines for longer. Today’s Saxum wines are accordingly better than ever. The only problem is finding them: I signed up for the mailing list in 2011, and Smith informs me that the current wait is around eight years. At Saxum, Smith characterizes the 2016 vintage as « easygoing and plentiful » after the challenges of the three preceding years of drought. The season’s heat spikes weren’t too serious, and fermentations went well. He employed less whole cluster than in 2015 but did very little crushing, emphasizing whole-berry fermentations. Having tasted most of these wines from barrel last summer, I was more than impressed by their positive evolution when I revisted them this April. Cette entrée a été publiée dans les vins, et marquée avec 2016, DOWNSTREAM, le 31 mai 2018 par philippecambie. Please send me an email to sign up for Downstream wines when it first gets released. Could I sign up for this wine? Interested in the first release. I’m also on the Chemere list and am a big fan of Manfred, Justin and Philippe. Please sign me up for your lists. Merci beaucoup!